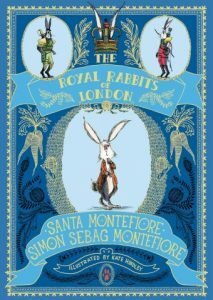 The Royal Rabbits of London, by Santa Montefiore and Simon Sebag Montefiore, illustrated by Kate Hindley, is the story of Shylo, a small, timid, rabbit, the runt of his litter, who rises above his limitations to save the Queen from a fate worse than death: being photographed in her nightie. Shylo’s quick-witted and has more bravery than he gives himself credit for, so when he’s swept up in the battle between the nasty rat photographers (under the command of Papa Ratzi – geddit?) and the Royal Rabbits of London, the noble defenders of the royal family, a secret society of rabbits who live beneath Buckingham Palace, he’s determined to prove everyone wrong about him. He’s not just a runt. And quick wits can sometimes succeed where brawn would fail. The story cracks on at a good pace, taking Shylo from the familiarity of his home burrow (where’s he’s bullied by his show-off big brother Maximilian) to Green Park in London, and then to the secret burrow beneath Buckingham Palace. He’s introduced to a dizzying array of rabbits, from suave Clooney to macho Zeno, jewel-obsessed Belle, American Laser (who’s been sent to help from her usual post as one of the White House Rabbits) and last but not least Nelson, the Generalissimo of the Royal Rabbits. Each one is brought vividly to life by Kate Hindley’s utterly wonderful illustrations. 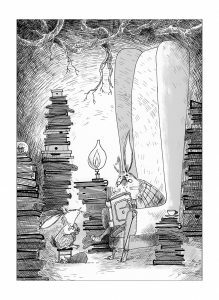 The story was fun, Shylo was a wonderfully engaging character, and the idea of a secret world of rabbits held great appeal – but it really was the illustrations that made this book stand out for me. Shylo with his eyepatch and his furry cheeks, an image of timidity overcome by determination, with his little patched jacket – I just loved it. The whole design of the book is wonderful, from the foil-stamped dustjacket to the gold-stamped silhouette of Shylo on the inside cover. Purely taken as a physical object, it’s a thing of beauty, and worthy of a space on anyone’s bookshelves. 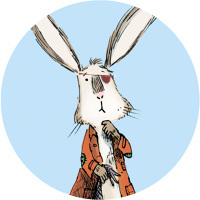 The sequel promises to reveal more of the secrets of the Royal Rabbits, and in particular about the mystery of Horatio, the old rabbit who tells Shylo about the Royal Rabbits and puts him on the path to heroism. I’m definitely looking forward to more stories set in this world – not least because it will mean more of Kate Hindley’s pictures of Shylo.